First, the good news … because you really could use some good news these days. The “Kochtopus” network trying to prevent the citizens referendum of the “vouchers on steroids” bill to privatize public education from appearing on the 2018 ballot lost in court on the first round. The trial judge dismissed the case saying “there is no legal basis for the challenge.” Dismissals for failure to state a claim are awful hard to overturn on appeal. In a six-page ruling made public Tuesday, Maricopa County Superior Court Judge Margaret Mahoney ruled that the law in effect last year when the referendum was filed did not give individuals the right to challenge petition drives. She pointed out it was repealed in 2015. Mahoney acknowledged that lawmakers did vote to reinstate the individual challenge law last year. And that change took effect on Aug. 9, 2017. But the judge pointed out that the petitions demanding a public vote were turned in on Aug. 8. Quite simply, Mahoney said, there is no legal basis for the challenge. The judge also rejected the contention by voucher supporters that some of the petitions had to be thrown out — along with all the signatures on them — because the required signature of the person notarizing the document does not precisely match the name on the notary’s official stamp. Mahoney said that’s not the way the law reads. And Mahoney also rejected the contention that some petition circulators made false statements to would-be signers about what the voucher expansion law would do if allowed to take effect, including that it would be the rich who benefit. The judge said voucher supporters, in filing suit, did not identify who made such statements, to whom they were made, how they were false, and whether the person who heard the comments relied on the statements in signing the petitions. Dude, you had your chance to prove your case and the judge said you failed miserably. You were dismissed for failure to state a claim. The Defendants should request an award of their attorneys and costs for bringing this frivolous claim. [U]nless her ruling is overturned, Mahoney’s order means voters will get to decide if there will be a big expansion in who is eligible to get a voucher of state funds to attend private and parochial schools. Now the bad news. 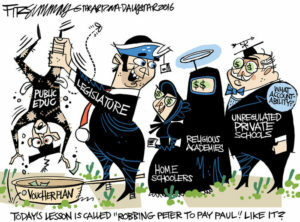 Our lawless Tea-Publican legislature and Koch-bot Governor Ducey could pass legislation this session to repeal the “vouchers on steroids” bill to privatize public education that they passed last year, rendering the referendum moot, just like they did with the citizens referendum of their omnibus GOP “voter suppression” bill to get it off the ballot, only to come back in the next legislative session to enact it piecemeal in order to make it extremely difficult for the citizens of Arizona to exercise their constitutional right to referendum. Gov. Doug Ducey, a beneficiary of “dark-money” non-profits linked to the billionaire Koch brothers, is headed to California for a weekend with the Kochs and their wealthy allies. The Republican governor, who is running for re-election, will travel to the summit on Sunday and return Monday, his spokesman wrote in an email. During his tenure, Ducey has pushed other policies aligned with the Koch network, including … promoting school choice” aka the “vouchers on steroids” bill to privatize public education, in violation of the Arizona Constitution. Arizona Gov. Doug Ducey extolled the expansion of his signature school voucher-style program at a summit of Koch mega-donors during an annual summit near Palm Springs last weekend. According to a story in the Washington Post, Ducey warned that a referendum loss in November could dramatically limit or complicate future attempts to expand the Empowerment Scholarship Account in the future. The Republican governor, who is a beneficiary of the Koch network, earned national accolades from school-choice advocates for muscling through an unconstitutional expansion of the Arizona program last year. The expanded Empowerment Scholarship Account program is on hold pending a referendum known as Proposition 305. 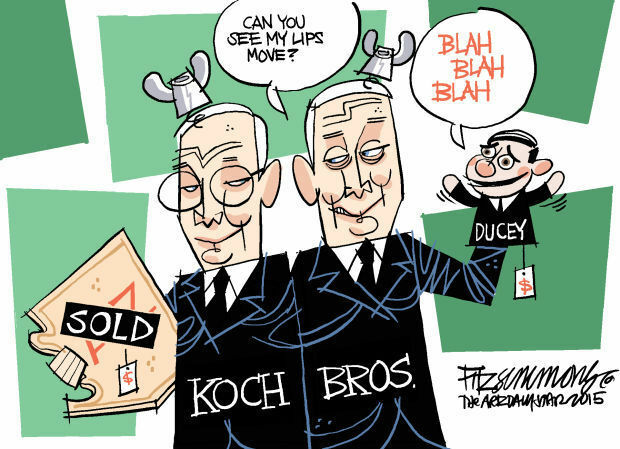 Dawn Penich-Thacker, spokeswoman for Save Our Schools Arizona, said Ducey’s comments show he is a “pawn” of the billionaire Koch brothers. “The governor is correct that this is a real fight in Arizona: it’s out-of-state billionaires and ladder-climbing politicians versus Arizona families and communities,” she wrote in a statement to The Arizona Republic. Gov. Doug Ducey has been answering to the square-dance call of billionaires David and Charles Koch since before he was elected to Arizona’s top political job. He’s back at it this weekend, doing a little do-si-do with a bunch of other politicians and wealthy political handlers at the Koch brothers annual weekend event, where the big money boys call the tune and order the steps and politicians dance. You know what inspires politicians? Some in direct contributions. 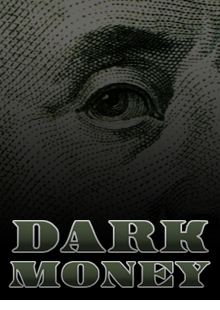 A lot more by way of untraceable “dark money” groups, for which the Kochs are king. Ducey’s chief of staff, Kirk Adams, knows all about such operations, having run one. Gov. Doug Ducey and his Koch brothers network of “dark money” bazillionaires have set their sights on saving Arizona’s expanded voucher law – the one that a grassroots group and 100,000 Arizona voters put on hold last year via referendum. The one that is now dead center in the sights of the Koch network as it prepares to spend whatever it takes – and say whatever it takes — to ensure the expanded voucher law will stand. The Washington Post, invited to sit in on the Koch network’s strategy session on education at its weekend retreat, reported Tuesday that the Kochs see Arizona as ‘ground zero’ in their push to reshape education. Just how far will the Kochs go? Already, the Koch-funded Libre Initiative is targeting Latino families to extol the wonders of Empowerment Scholarship Accounts, as vouchers are called. Meanwhile, the Post reports that Ducey introduced Steve Perry, of Capital Prep Charter Schools in Harlem, N.Y., who has been coming to Arizona to speak in support of the voucher law. Actually, in Arizona the teacher union is unencumbered by any actual power. If it had any, would our teachers be among the nation’s lowest paid? In fact, Arizona’s teacher union had nothing to do with the referendum on vouchers. Nor was it a Democratic Party effort (in case that’s the next red herring launched). Save Our Schools Arizona was started by a handful of ordinary citizens who met at the state Capitol last year while waiting to testify against the voucher bill. These political neophytes were so angered by the bill’s passage that they decided to launch a referendum to try to stop it. This, despite every so-called political expert’s warning that it couldn’t be done – not by a group of citizen volunteers with no major financial or organizational backing. So they did it anyway, sending the powers-that-be – in and outside of this state – reeling. And that, ladies and gentlemen, cannot be allowed to stand. The Arizona Education Project, which is backed by the Arizona Chamber of Commerce and Industry, utility company Pinnacle West, among other contributors, wants to tell the “other side of the story” to counter the negative voices dominating the education debate in Arizona, the group’s spokesman, Matthew Benson, told the Arizona Capitol Times. “Arizona schools aren’t perfect, but we’re making tremendous progress in the state,” Benson said. 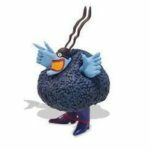 In the first week, the group will spend six figures on local TV, cable and digital ads, and then gauge from there how much to spend more and where, he said. 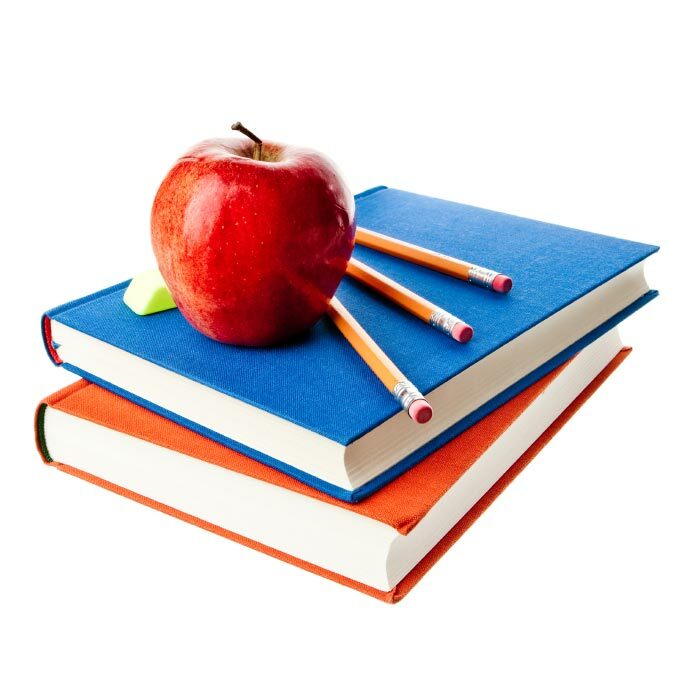 The group has put up a website outlining positive points about Arizona’s K-12 system. Spending on Arizona schools plummeted during the Great Recession, and the state has yet to return to the spending levels before the economy tanked. Arizona schools also rank among the lowest in the nation for teacher pay. A television ad that ran Jan. 22 boasts about the state’s improvements in education spending and outcomes. Benson said that, as a 501(c)3 nonprofit, the group has no connection with any candidate, campaign or legislative effort. [This is legalese for “dark money.”] Instead, it’s a public education campaign to tell Arizonans that their schools produce a lot to be proud of, including performance, improvements and school choice, Benson said. Benson said the group has nothing to do with Gov. Doug Ducey’s re-election campaign because it’s a nonprofit. As for whether the ad, which echoes Ducey’s talking points on education, could boost the governor’s re-election bid this year, Benson said it isn’t for him to speculate. GOP apologist and former board member of the Phoenix Chamber of Commerce and the “Kochtopus” Goldwater Institute for Public Policy Research, Robert Robb at The Republic, sniffs What’s wrong with some good news about Arizona schools? This apologist for corrupt GOP politicians and their dark money in Arizona really needs to go away.